Participation in this vacation requires purchase of the following flights from Avalon Waterways, not included in pricing: (1) roundtrip air from your U.S. gateway and intra-vacation air segments; or (2) intra-vacation air segments only, starting at $825. 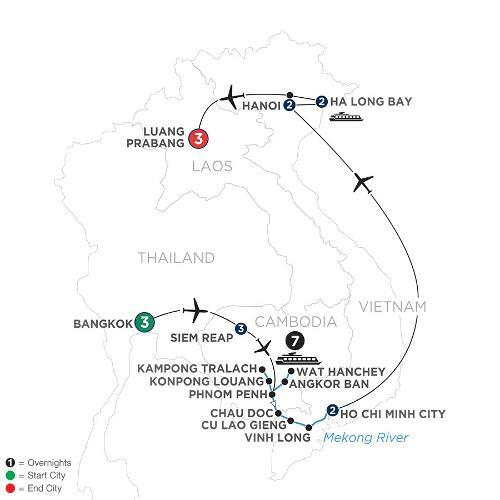 Required intra-vacation air segments: Bangkok/Siem Reap; Siem Reap/Phnom Penh; Ho Chi Minh City/Hanoi; Hanoi/Luang Prabang. Air prices were effective on February 6, 2019 and their availability is limited. At the time you purchase your tour, air prices may be higher.